Apo-Diclo SR (Diclofenac Sodium) is an analgesic used to relieve pain and to treat inflammatory disorders such as arthritis. This medicine is prescribed for patients with many different types of musculoskeletal disorders, including rheumatoid arthritis, osteoarthritis, ankylosing spondylitis, gout, frozen shoulder, tenosynovitis and bursitis. Apo-Diclo SR (Diclofenac Sodium) is an analgesic used to relieve pain and to treat inflammatory disorders such as arthritis. This medicine is prescribed for patients with many different types of musculoskeletal disorders, including rheumatoid arthritis, osteoarthritis, ankylosing spondylitis, gout, frozen shoulder, tenosynovitis and bursitis. It is also indicated for pain management caused by kidney stones or injuries (including sprains and fractures), and is sometimes used for post surgery pain. Additional uses include fever, tooth pain, migraine headaches and other disorders which are not mentioned here. 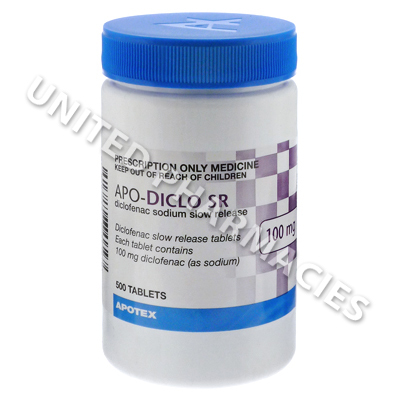 Apo-Diclo SR (Diclofenac Sodium) comes as enteric coated 100mg strength tablets, meaning that a special polymer barrier is applied to the outside of the tablet. Careful consideration will be needed by your doctor when deciding upon the right dosage, and numerous factors will need to be considered, including the condition being treated and the severity of symptoms. Adults treating acute pain which ranges from moderate to severe in nature may be told by their doctor to take 100mg to 150mg per day. This dosage schedule may not be used for all patients, and those treating mild pain or using it on a long term basis for the relief of chronic pain may be treated with a lower dosage. The tablets should be swallowed whole and not crushed or chewed. Always use Apo-Diclo SR (Diclofenac Sodium) as you have been prescribed by your doctor. Never self-medicate or change your dosage without first consulting your doctor. The correct dosage can vary depending on your health, medical history, and the severity of the condition being treated.